The house has 3 bedrooms and 2 bathrooms that are distributed over 2 floors with independent entrances. 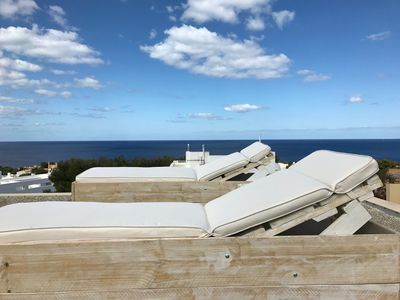 The main floor has 2 bedrooms and a bathroom and living room with view to the sea and Es Vedrá and 2 terraces: one with sea view and another at the entrance. It has a fully equipped kitchen. On the upper floor there is a double bedroom with bathroom en suite and has a large terrace overlooking the mountain of Sa Talaia and Es Vedrá and another upper roofterrace with 2 loungers with a beautiful view of 360 degrees to the mountain, Es Vedrá and the sea. The house is fully furnished and well equipped with WiFi, washing machine, dishwasher, air conditioning etc. To make a booking a 30% booking deposit is required. Ideal for families and quiet couples. You are not allowed to make any noise or parties that might disturb the neighbors. Arrivals or departures between 8am and 8pm are free of charge. Check in between 8pm and 10pm is subject to a charge of € 50. Check in between 10pm and midnight is subject to a charge of € 100. Check in between midnight and 2am is subject to a charge of € 200. Check in between 2am and 3am is subject to a charge of € 300. Check out between 8am and 7am is subject to a charge of € 50. Check out between 7am and 6am is subject to a charge of € 100. Check out between 6am and 5am is subject to a charge of € 200. These supplements are to be paid cash upon arrival at the property. It is the client´s responsibility to inform the company about the details of your flight / arrival. In case the correct information is not received, the company can not be held responsible for any delay or other inconveniences at check in. After you have landed and have left the airport and are on your way to your holiday home, please text or call the contact person you have in the booking confirmation to announce your arrival at the house. The deposit, if not paid directly to the web , is always to be paid in cash or by PayPal at check in, together with the balance due , the remaining 70%, which is also to be paid in cash or by PayPal at arrival. If you want more than 2 sets of keys or anything else, please let us know when you make your reservation, before your arrival. Do not exceed the number of persons for which the reservation is made, otherwise extra charges will be applied or even the access to the property may be denied.